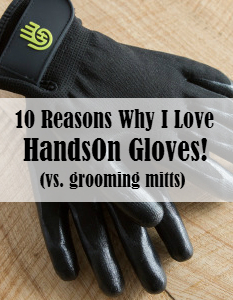 Are you a fan of traditional grooming mitts? I was! They’re handy for removing hair, sweat, mud, all while giving my horses a well deserved massage and a good scratch. But over the years I’ve developed a love/hate relationship with them.Yes, they’re inexpensive (usually about $6 each), but they just don’t last. The seams tear, the bumps wear down, the plastic cracks, they collect dirt on the inside, and it usually doesn’t take long to end up in the garbage. Not very practical, but despite all this they were still a staple in my grooming kit…until now! 1. Movable fingers. Unlike a mitt, each finger has scrubbing nodules to get a deep down clean with less effort. 2. Multitasking. Need to stop grooming and grab a hoof pick? No problem, I find it easy to pick up what I need while keeping the gloves on. 3. Great fit. With two size choices the gloves fit snug and don’t slip off. 4. Spotless hands. Keeps the dirt and oil off of my hands and out of my finger nails. 5. Happy horses. Every horse I’ve tried these on loves it, even the ones that don’t usually react to grooming. 6. Use wet or dry. I found they work great for removing stains while bathing, and they dry quickly too. 7. Save time. With two gloves it almost cuts my grooming time in half. 8. High quality. These gloves are built to last. 9. Easy to clean. Dirt and hair comes off with a flick of the wrist. 10. Great for all pets. I couldn’t believe how much hair came off my dogs! 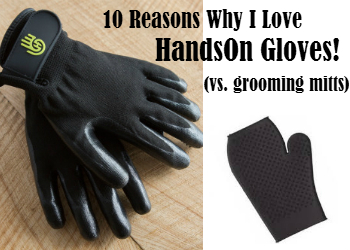 At under $25 a pair, these gloves are well worth the investment! I estimate I’ve spent double that in the last few years on mitts and curry combs, and I won’t be going back to those.